There's lots of cheap, easy to obtain recipes in Azeroth - and beyond. Most of these are sold by vendors, requiring no more than a couple of minutes to obtain. Some of them also sell very fast, even if the price has three digits on it! A single recipe worth hundreds of gold! 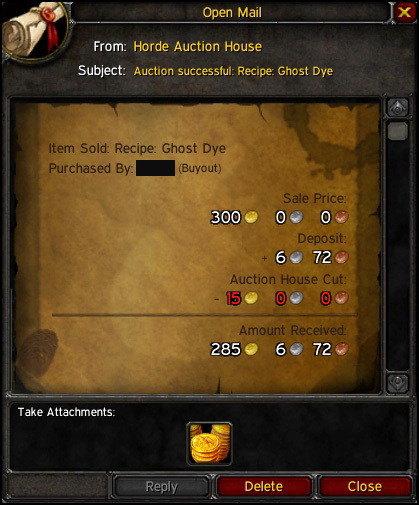 The recipe for Ghost Dye is sold by 2 different vendors in Feralas, one for Alliance and another for Horde. Click on the correct NPC below to see their exact location. The Ghost Dye Recipe costs 90 silver on the vendor and should be sold for no less than 300 gold in the auction house. But if there's competition, you may have to rethink your strategy. Some of these sellers only bought one and have no intention of grabbing another from the vendor after the first one is sold, so it's often safe to keep the price at 300-500 gold, even if there's someone else selling the same recipe. I usually sell them for 300g, but I've managed to sell some for even 700g. However, there's more profit to be made if you keep the price lower than that so they sell faster! The recipe is a limited quantity item, so the vendor has only one for sale and you have to wait 20 ish minutes before the vendor has more available. To make fast sales, keep the price below 500g. Keep in mind that even on a large population realm it usually takes 1-3 days to sell one recipe. Still, considering how fast you can obtain a recipe, it's well worth the wait and the deposit fees are nonexistent. Just remember to keep only one for sale at a time to make it look more unique. Some people learn the recipe instead on their Alchemist and sell the Ghost Dyes for 50-100g each. Personally I only sell the recipe, but it would seem there's profit to be made by selling the crafted dyes too. There are an awful lot of vendor recipes that can be purchased to sell for a profit. I am in the process of making a full list, they can be slow sellers. But having covered the 'classic zones' I probably sell a handful of recipes every day. Even recipes had from the faction capitals can go for large sums of gold if you are the only seller, which makes this a good way to make some initial gold. The beauty of knowing where these vendors are is that questing toons can make extra gold without extra time investment. I would recommend 'levellers' to make sure Desolace is included in their journey for Vendor-Tron 1000 /Super-Seller 680. These guys sell some faction exclusive limited supply cooking recipes that will regularly sell for hundreds. Yup, there's lots of vendor recipes out there that can be resold for profit. I've made 2 posts that includes almost all of them. They are in the recipe reselling category. Looks like some of that was moved to the 'Elite' section, and therfore not really accessable.